The FortiGate 200D series delivers high-speed security and performance for campus perimeter and branch office wired or wireless networks. Purpose-built processors provide up to 4 Gbps firewall throughput, enabling protection of your applications and network without affecting availability or performance. High-density GE interfaces facilitate network growth and expansion. 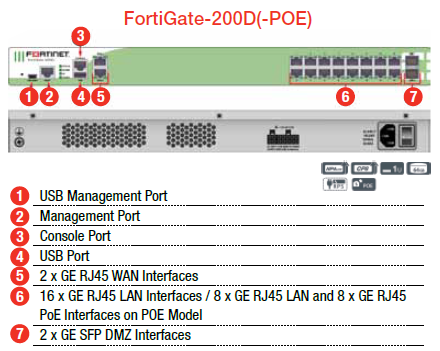 The FortiGate 200D series provides comprehensive threat protection with Fortinet’s unmatched range of enterprise-grade security technologies. They deliver firewall, VPN (IPSec and SSL), intrusion prevention, antivirus/antispyware, antispam, and web filtering technologies. These platforms also provides application control, data loss prevention, dynamic routing for IPv4 and IPv6, endpoint NAC, and SSL-encrypted traffic inspection. These comprehensive security components enable you to deploy required technologies most suited for your unique environment. The FortiGate 200D series installs in minutes, automatically downloading regular updates to protect against the latest viruses, network vulnerabilities, worms, spam and phishing attacks, and malicious websites with no administrator intervention. Leveraging patented FortiASIC acceleration, the FortiGate 200D series offers marketleading performance, with high-density GbE interfaces that facilitate network growth and expansion. Onboard storage provide local archiving of data for policy compliance and/or web caching. Power Over Ethernet Seamless integration of peripheral devices in a secure environment. Feature Select Instantly fine-tunes the FortiGate based on desired deployment needs using feature presets. Simplifies user administration and configurations while providing flexibility for different deployment modes. Contextual Visibility Presents critical deep insights into historic or real-time network activities with data on threat details, IPs, users, devices, applications and more. 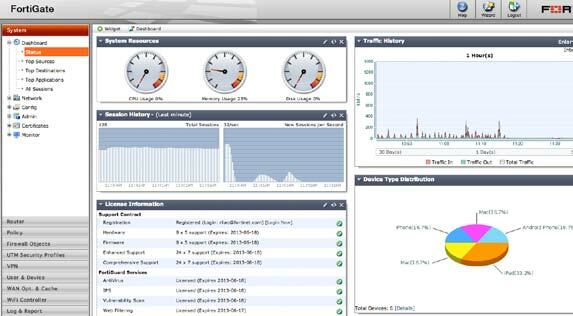 Allows administrators to quickly understand threats and stop them. Advanced Security Multiple advanced technologies can be coordinated to look for and stop today’s blended, targeted or unknown attacks. Efficient packet handling improves performance while lowering latencies and reducing network complexities. 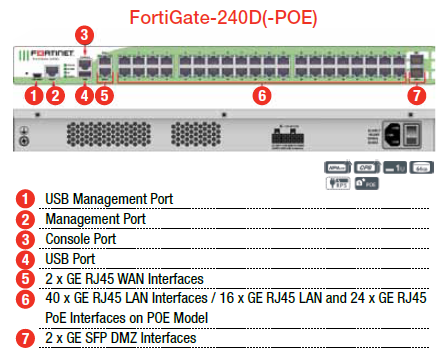 Download the Fortinet FortiGate240D_POE Data Sheet (PDF).